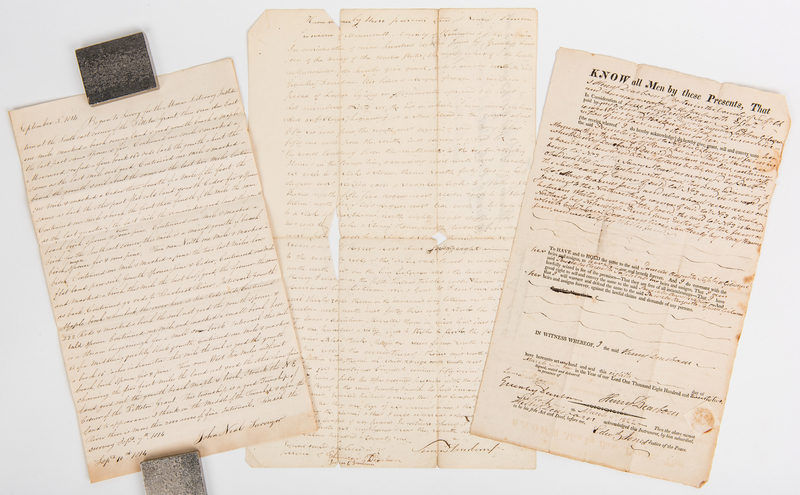 Four (4) early 19th century documents, including Henry Dearborn family land documents and "A Petition of The Prisoners of Hope". 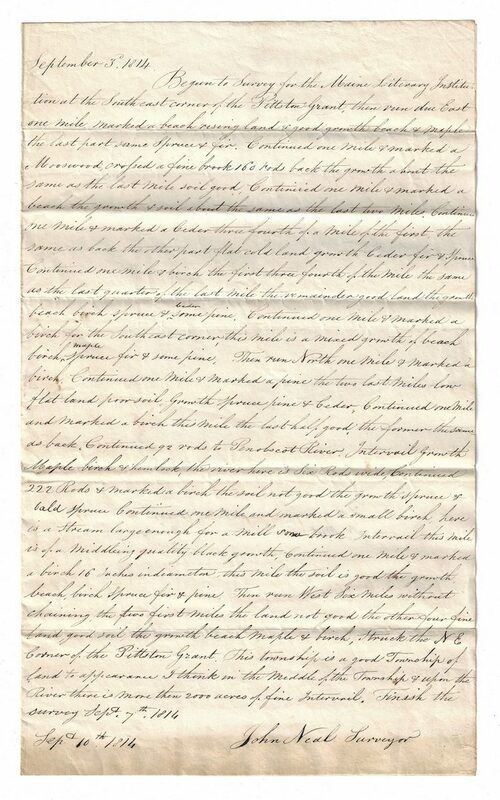 1st item: Land deed between General Henry Dearborn and Pamela Augusta Sophia Gilman (1802-1880), his granddaughter, dated March 8, 1822. The document, partially printed with handwritten text in Dearborn's hand, grants Pamela "my farm in Monmouth in the County of Kennebec and State of Maine…containing about one hundred & twenty acres…being Lot No. 3 of the Sawyer Street…together with about ten acres adjoining to the Southeasterly corner of said Lot No. 3…and Mrs. Mary Briovin's farm…I the said Henry Dearborn have hereunto set my hand and seal this eight day of March in the Year of our Lord One Thousand Eight Hundred and twenty two…" witnessed by Laura M Gay and Greenleaf Dearborn (1786-1846), her husband, with additional Henry Dearborn signature, signed by Edward Jones, Justice of the Peace. Testament that it was entered into the Kennebec County records, Book 44, Page 01, on August 13, 1822 by John Havey, en verso. 13 1/2" H x 8 1/4" W. 2nd item: Land deed between Simon Dearborn, Jr. (1760-1853), nephew of Henry Dearborn, and Greenleaf (Greenlief) Dearborn, his son, dated September 7, 1821. The document, handwritten in Simon's hand, grants Greenleaf "In consideration of nine hundred dollars…a certain tract of land lying in Monmouth aforesaid & is part of Lot numbered thirty six…beginning at a stone placed in the ground about fifty six rods from the north east corner of said lot & about fifty one rods from the south east corner of said lot…To have and to hold the aforegranted premises with the privileges & [appartenances] thereof to the said Greenlief his heirs & assigns…In witness whereof I the said S. Dearborn Jr have hereunto set my hand & seal this seventh day of September & eighteen hundred & twenty one…" signed, sealed and delivered in the presence of his children Ebenezer S. Dearborn (1798-1830) and Dorcas C. Dearborn (1796-1869). 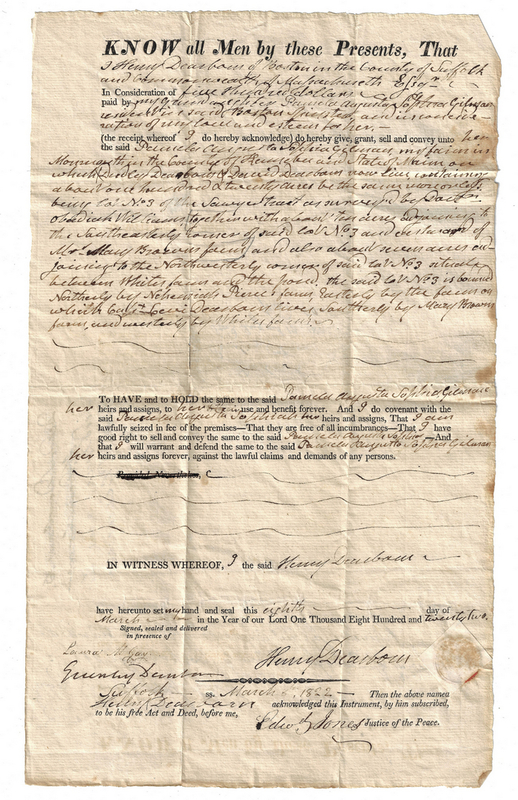 Testament that it was written and signed on September 15, 1821, before John Chandler, Justice of the Peace of Kennebec County, with additional notice stating that it was received and paid on April 9, 1823, en verso. 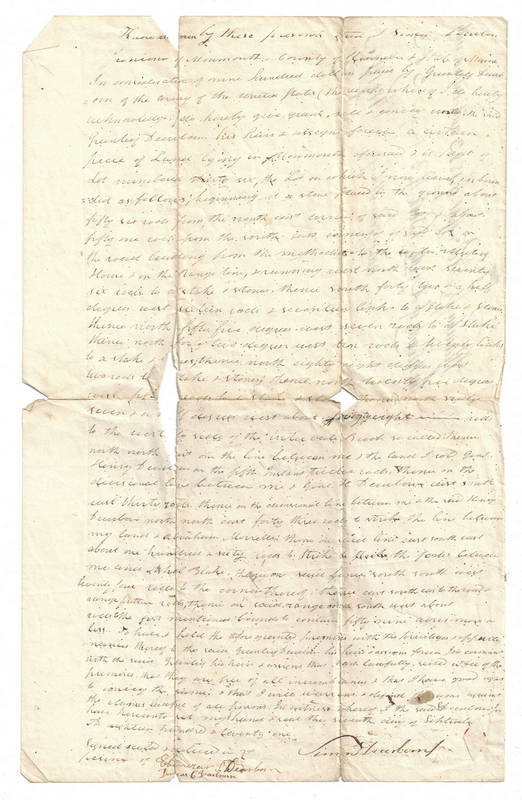 15 3/4" H x 9 7/8" W. 3rd item: Surveyor's handwritten report conducted by John Neal for the Maine Literary Institution (now Colby College in Waterville, Maine), survey started on September 3, 1814 and completed September 10, 1814. Neal begins his survey "…at the South east corner of the Pittston Grant, then run due East one mile marked a beach rising land & good growth beach & maple the last part same Spruce & fir. Continued one mile & marked a Mooswood, cro[s]sed a fine brook 160 rods back the growth about the same as the last mile soil good…". He continues his report in a similar manner, his final evaluation stating "This township is a good Township of land to appearance I think in the Middle of the Township & upon the River there is more than 2000 acres of fine Intervail [sic]". He notes that he finished the survey on September 7, 1814. 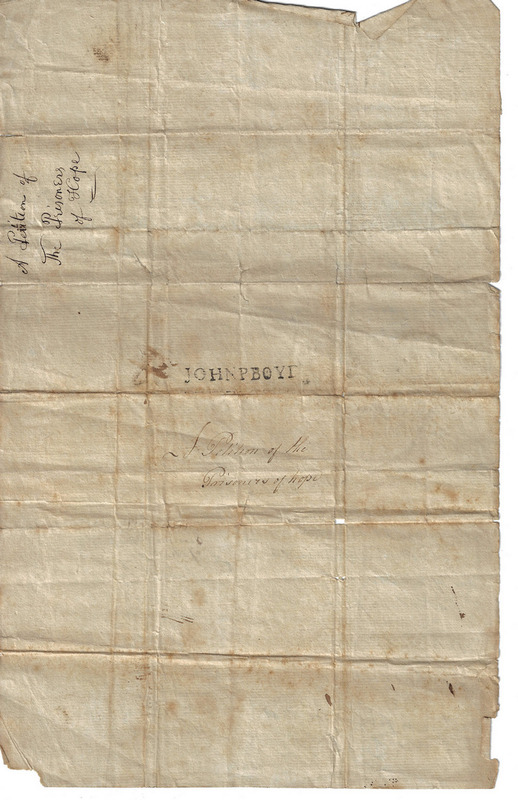 Additional notations, interior of folded sheet, with "John Neal's Survey 1814 No. 1. township", en verso. 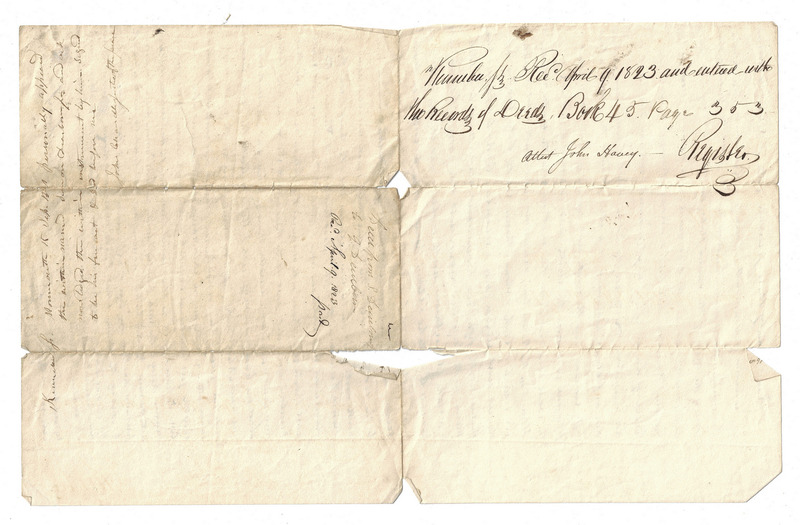 13" H x 8" W. 4th item: One page, handwritten document titled "A Petition of The Prisoners of Hope" from the Portland Jail, Maine, addressed to the Honorable Gentlemen of the Day, dated July 4, 1803. They write "We Pray Love to inform your honors, as this is the Glourious Day, that this has Given birth & a flourish in Commerce to the United States. We have been faithfull [sic] subjects of the Union & hope to be a Gain, & as this Day is Celebrated all throug [sic] the union we your [humble] Petitioners pray of your honors to Extend you Generosity towards we Poor prisoners, as it is not in our power to Celebrate it, Which we hope shortly to imbrece [sic] the sweets of Liberty…We your [humble] Petioniers, beg of your [honors] to record them in your minds, so that they may. Drink to that Glorious Character [George] Washington, & will Cause them, & will cause them to pray for the Eagle to ever reign independent & the Long Life & prosperity of every faithfull [sic] American is the Ernest wish of…". 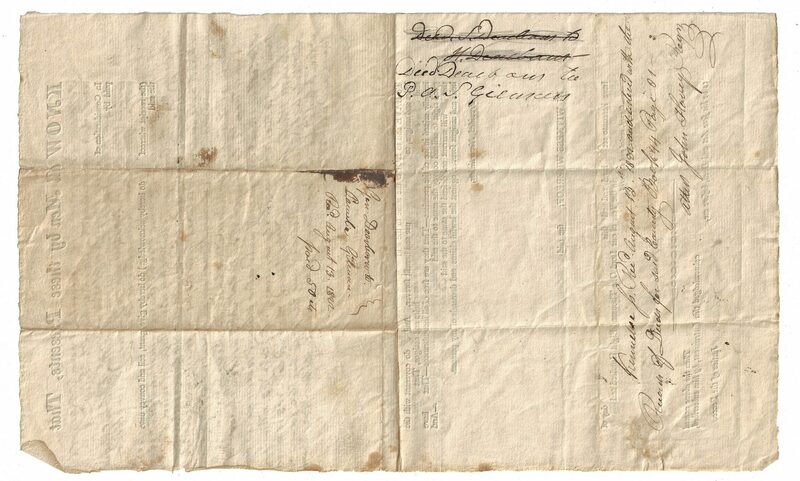 Includes ten signatures, one crossed out, with a note reading "there is five more that is not signed" below a poem reading "May hail rain & snow/Crush all the american foe/That offers the first blow/to Disturb our peace". Address panel with black ink stamp reading "John P Boyd" with "A Petition of The Prisoners of Hope" inscribed twice. 12 1/8" H x 7 3/4" W. Provenance: the Estate of Charles Boyd Coleman, Chattanooga, TN; descended in his family from Greenleaf Dearborn, born in Monmouth, ME, on August 7, 1786 to Simon Dearborn, nephew of Henry Dearborn, and Molly Blake. Greenleaf married Pamela Augusta Gilman, granddaughter of Henry Dearborn, on April 2, 1822 . Their daughter, Annette Maria Dearborn Boyd, was married to Charles Harrod Boyd; they had four children including Julia Wingate Boyd (wife of Lewis M. Coleman, Jr., a descendent of U.S. Supreme Court Justice John Marshall). (source: "The Maine Historical and Genealogical Recorder", Vol. 3 by S.M. Watson, 1886). CONDITION: 1st item: Overall good condition with foxing spots, toning impressions, dampstaining, to be expected from age. Henry Dearborn signatures in strong, clear condition. 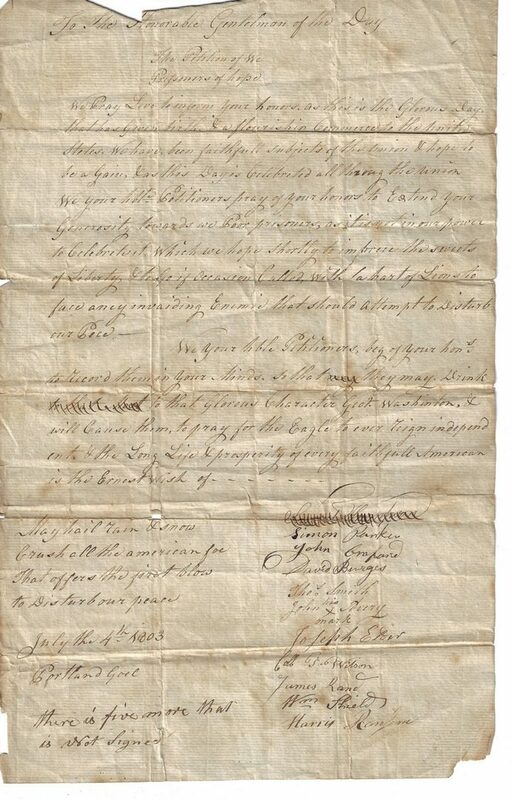 2nd item: Tears, largest 6 1/2" H x 3/4", primarily along fold lines of document. Simon Dearborn, Jr. signature affected by tear along fold line in other good condition. 3rd item: Overall good condition with minute foxing spots, areas of toning, to report. Neal's signature slightly affected by 8" x 3/4" line of toning across bottom of report, otherwise in strong, clear condition. Overall good condition with foxing spots, toning, tears, dampstaining, to be expected from age. Writing and signatures in legible condition.